Down's syndrome. 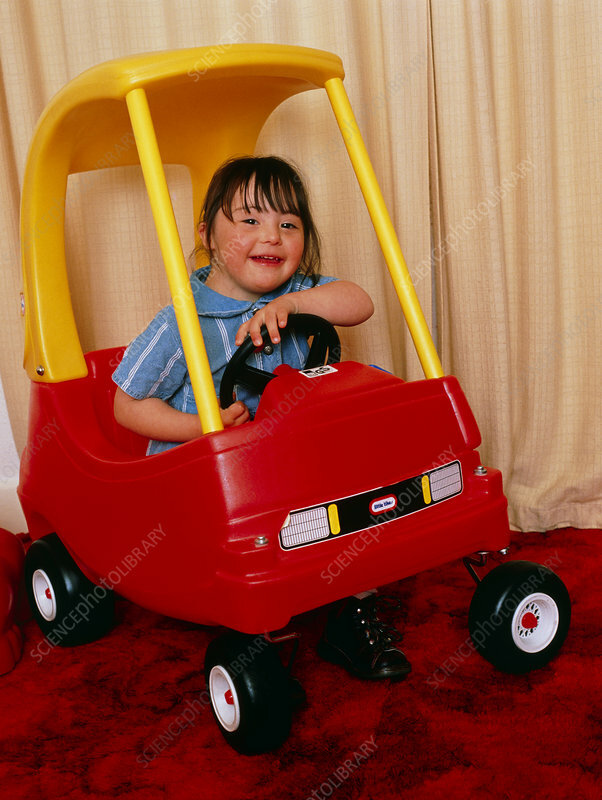 A four year old girl with Down's syndrome, also known as trisomy 21, plays in a toy truck. Down's syndrome results from a chromosomal abnormality; each body cell contains an extra chromosome (number 21) so that there are 47 chromosomes rather than the usual 46. This results in a variable mental handicap; IQ usually lies between 30 and 80 (almost all affected children have learning potential), and distinctive appearance with upward-sloping eyes. Heart defects, congenital deafness and leukaemia are more common in people with Down's syndrome. About one in 650 babies shows this abnormality & this rate increases with increased maternal age.